Enjoy A Comfortable Ride To and/or From The Airport. 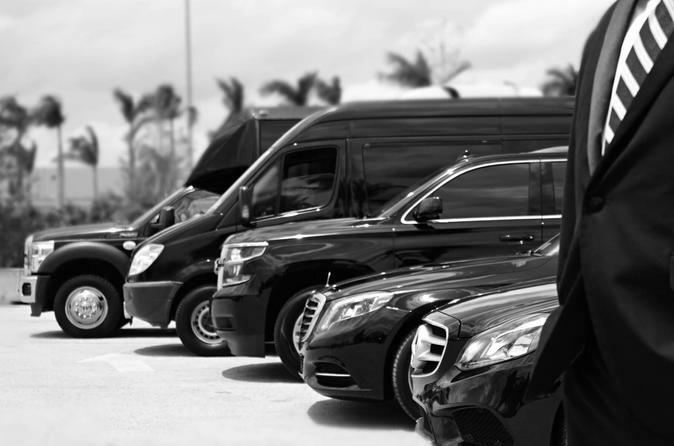 We provide Clean, Luxurious Private Vehicles for Your Transport. Our Drivers are Polite & Courteous, offering Every Client The Presidential Treatment. We Offer Prompt Service, Whether is Picking You Up From The Airport or Taking You Catch Your Flight. We Will Pick You Up From Your Hotel, The Airport, or Your Residence. In Route we will Travel a Miniature Scenic Route giving you the opportunity to do some sort of Sightseeing. We Will Drop You Off at Your Hotel, The Airport, or Your Residence, thus giving you Door to Door Service. The Package is For Parties of 2. Additional Passengers can be added on to this Package upon request at a Discounted Rate. ALL Children must be Accompanied by an Adult. There is ABSOLUTELY No Smoking permitted inside The Vehicle. If You Enjoy Our Services, Which we Believe You Will, Additional Transportation Services / Accommodations are Available upon Request To You and Your Party at a Discounted Rate. While In Transport, If You would like Hire The Vehicle for Additional Hours to make additional stops, You May Submit Request; ALL Requests are Subject to the availability of The Vehicle will acquire an Additional Cost, at a Discounted Rate of Course. All Taxes & Fees are included in The Price, EXCEPT GRATUITY, which you are asked to give directly to the Driver.